« August 16th Is National Rum Day. Where’s The Bacardi At? There are days where you are looking for a different adult beverage. In the summer you are looking for a cool and refreshing drink. Have you ever tried a glass of wine on those certain occasions? There is a new wine on the market called Honeyvine. This wine is light and crisp. 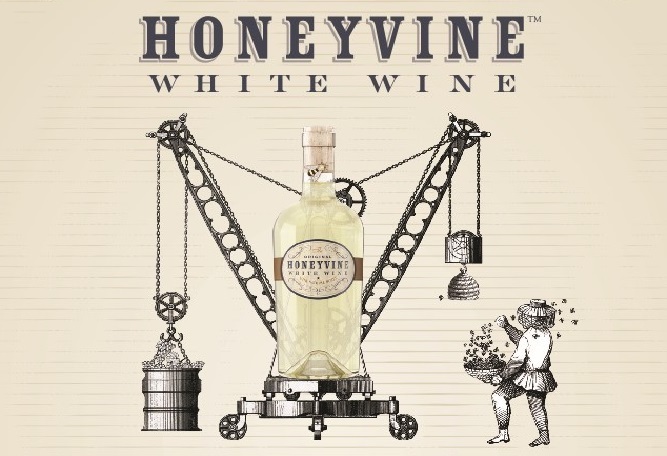 Honeyvine white wine is a modern twist on the ancient honey drink, called mead, which dates back to early civilizations. Honeyvine is a proprietary blend of premium white wine, natural honey and honey essence for a crisp, more refreshing-tasting take on honey wine. The natural flavors of honey and wine offer intrigue because both are influenced by their place of origin. The same grape variety grown in different soils, site exposure, climate and vintage yield wines of different flavor profiles, just as flavor of the honey depends on the source of flower pollen that the bees bring back to the hive. The wine gives off scents of honey and orange blossom. The taste has honey that complements apple and pear, rounding out the taste profile and providing just a hint of sweetness with a juicy and lingering finish. This new twist on mead is not as sweet as a dessert wine and makes a refreshing aperitif or complement to lighter entrees. Winemaker Reggie Hammond added natural honey and orange blossom honey essence to enhance the flavors of wine, rather than the ancient practice of fermenting the honey. He selected premium California vineyards, pressed the grapes and cool-fermented their juice in stainless steel tanks, resulting in a dry, white wine similar to an unoaked Chardonnay. This wine, with its fresh varietal flavors and crisp acidity, acts as a backdrop for the natural honey and orange blossom honey essence. The honey rounds and balances the wine, giving it a light sweetness and a lingering honey finish. Print article This entry was posted by Art Eddy III on August 17, 2015 at 4:41 pm, and is filed under Lifestyle. Follow any responses to this post through RSS 2.0. Both comments and pings are currently closed.